We had a bit of a scare this afternoon when the school office rang up to inform us that another kindy kid had been sent to sick bay with a suspected case of chicken pox. However, as that girl is not in Jeremy's class and as he doesn't play with her, the doctor told us just to watch and wait. We will ring the school office on Monday morning to confirm if she has chicken pox. Otherwise, if he had been in close contact with her, he would have ended up in hospital for an injection of zoster immune globulin (ZIG) which provides temporary immediate protection against chicken pox - and he probably would have had to stay in hospital for a few days for further monitoring. Jeremy cannot have the chicken pox vaccination at the moment, because it is a live vaccine and his immune system has not fully recovered. Therefore, he is still at risk of serious illness if he comes into contact with infectious diseases such as chicken pox, mumps, measles, rubella etc. And as the weather is cooler and it is darker in the mornings, when Jeremy wakes up around 5.30am, he is happy to go back to bed for another hour or so - maybe he thinks it is still the middle of the night! The weather has turned cooler now, so Jeremy started wearing his winter uniform today. On this day last year, Jeremy had his first platelet transfusion. So much has happened since then, and we are thankful that we no longer have to keep track of his platelet and red blood cell counts every few days and worry as they kept on dropping. If his platelet count fell to 20, then he needed a platelet transfusion - likewise, a haemoglobin count of 70 meant a red blood cell transfusion. Stephanie and Jeremy have been busy little cooks this weekend. Yesterday, they baked Anzac cookies and tonight they made sausage rolls. Unfortunately, after his enthusiastic cooking efforts, Jeremy refused to eat the inside of the sausage roll - he would only eat the fluffy bit of the puff pastry! At least he liked his Anzac cookies, and wanted to eat them for breakfast and also as dessert after dinner tonight. Today's special treat was lunch at Makoto Sushi - Jeremy's favourite sushi place. He and Stephanie were so thrilled about going there, because they both love sushi and it was Jeremy's first time that he has eaten sushi (ie. proper Japanese sushi with raw fish, not homemade sushi with cooked chicken inside!) since transplant. For us, the special treat was enjoying his excitement as he ate his salmon sushi and tobiko sushi with such pleasure and delight. 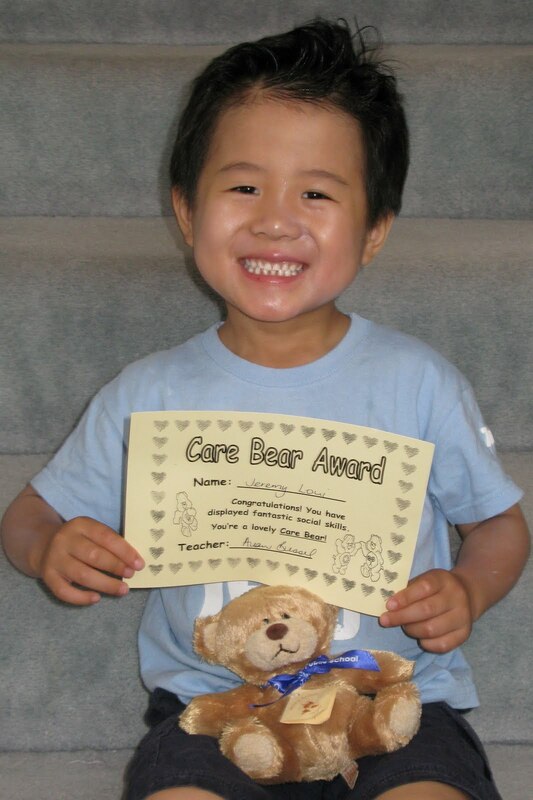 Today was the end of week 1 of Term 2, and Jeremy brought home "BoyBoy Bear". At the beginning of the year, every kindy kid at our school is given a teddy bear who sits on their desk during Term 1 and helps them learn about caring and sharing. The teacher introduces them to the Care Bears, and on rainy days the kindy kids watch Care Bears videos before school! Stephanie and Jeremy love to play at Sandpit Park after school, and we are thankful for this unusually warm autumn weather where they can dig around in the sand and enjoy these sunny afternoons outside. 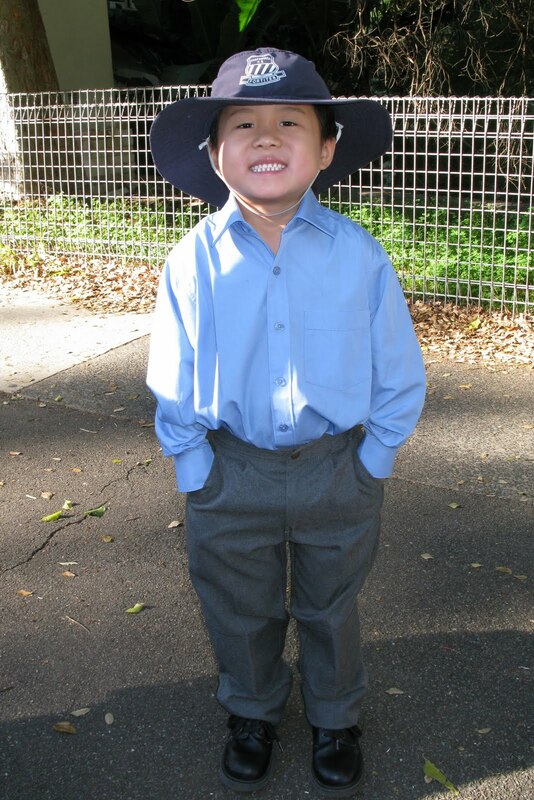 First day of Term 2, and Jeremy was happy to be back at school. He must have been looking forward to it, as he woke up in the middle of the night saying "Dolls are dancing, D, D, D"! 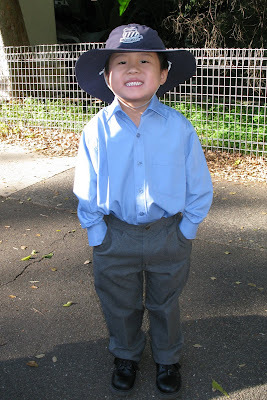 We pray that he has another enjoyable term of kindy, and that he stays healthy and doesn't catch anything from the other children at school. This afternoon, the doctor told us that the results of last Monday's (12 April) bone marrow aspirate are MRD Negative (no detectable leukaemia cells) - praise God! Stephanie and Jeremy had a fun day in the park enjoying a BBQ lunch, playing with their friends, and riding their scooter and bike around the biketrack. Afterwards, they played more Uno with EeEe and Dr KonKon. Thankfully Jeremy's temperature stayed down today! Jeremy and Stephanie were very excited to go to the city today, as they love catching trains and it was Jeremy's first time on a train since transplant! They had a wonderful outing meeting PawPaw and running around Hyde Park, visiting Mummy's old work friends and having lunch with BaBa. Despite being full of energy and otherwise happy, Jeremy felt warm to the touch all day - when we took his temperature at 5.30pm, he was 37.8 degrees! We quickly gave him Panadol, and soon his temperature was back to normal. Maybe this was a late side-effect of his vaccinations on Monday? We are thankful that Jeremy had no adverse reaction to his first set of vaccinations! Jeremy and Stephanie ran around playing tip/chasings with other people at morning tea after church. PawPaw and KonKon came by and we did a bit of gardening, amused the kids, and then stayed for dinner. We tried encouraging Jeremy to eat some more as he will have his special medical sleep tomorrow, and will not be able to eat again until after his bone marrow aspirate. Today was a busy, tiring but happy day which finished with multiple rounds of Uno - Stephanie and Jeremy's favourite game these school holidays! It is great that we can enjoy this card game together as a family. This morning we met some of Jeremy's kindy classmates at Willoughby Park. This park is a very popular park, and it was hard to keep track of some of the younger siblings. Stephanie and Jeremy had fun playing chasings and hide-and-seek. This morning we enjoyed a show about freaky forces and sound effects by Questacon, which was held at Stanton Library. The two presenters were very entertaining as they explained and demonstrated basic science concepts such as friction, gravity and sound waves. Then we had a fun picnic lunch and a very energetic game of tip with some preschool friends at Spider Web Park. Jeremy's next bone marrow aspirate will be on Monday 12 April, and we are praying that the results will be free of leukaemia. While he is having his general anaesthetic, he will also have the first of his childhood immunisations, and hopefully he will not have any adverse reaction to it. Stephanie and Jeremy were very excited to play at Sandpit Park with C & C this afternoon, and they all had a good long play together. It was Jeremy's first time at Sandpit Park since transplant, and he loved digging in the sand and playing chasings! At dinnertime, Stephanie's wobbly top tooth came loose and she pulled it out all by herself. This is number 4 baby tooth to add to her collection. Easter Monday turned out to be a busy day for us - it started very early thanks to 2 hungry children! Without much effort, we were out of the house before 7.30am! At this time of morning, it was easy to get parking down at Bunnings (which opened at 7am), and we didn't even have to walk past the bbq-man (they were only getting ready at that time). The children loved the mini-trolleys that were there - they raced around and around and around with them, and then played chasings as it was still quite empty. Our Easter Sunday started at 4.30am (new time!) with Stephanie appearing and saying she wanted to play! After she was tucked back into bed, we were woken a second time at 4.50am by Jeremy demanding that we get him dressed and feed him breakfast! How we do love the end of daylight saving! After church this morning, we had a fun lunch and play with SookSook, SookMo and Cooper. Stephanie and Jeremy kept asking them to play chasings - their favourite game at the moment! Easter Saturday started with Baba fasting for a blood test. The children were happy to watch Baba have a needle put in his arm, and it was good that the lady at pathology was fine with the audience. We had a quick run through the shopping centre and crossed off a few to-do items from our list. Baba happily watched 2 Clarkson DVDs whilst Stephanie had fun preparing lunch with Dr KonKon. After the cooking was done, Jeremy surprised us as he quickly chomped through the chicken and then the pork that was on offer. In the afternoon, we made a quick dash to the new HomeHQ shopping centre. Freedom made a #fail with regards to the rug we were interested in - marked incorrectly and then found to be out of stock! This morning we went to Epping Baptist to worship with Dr KonKon and to remember how much Jesus loves us. It was nice to meet more people today who have been praying for Jeremy, as well as their new minister. During the drive out there, we saw a police patrol car, and remembered that it is a double-points long weekend!! This afternoon PawPaw and KonKon came by with cousin Cooper to play. They had fun playing Easter egg hunts together and getting beanbag rides. Jeremy was in a good mood and even played some piano pieces for PawPaw and KonKon (while hiding under a blanket!). Stephanie and Jeremy were very happy to try BaBa's "popcorn chicken" for dinner, and kept saying how delicious it was! 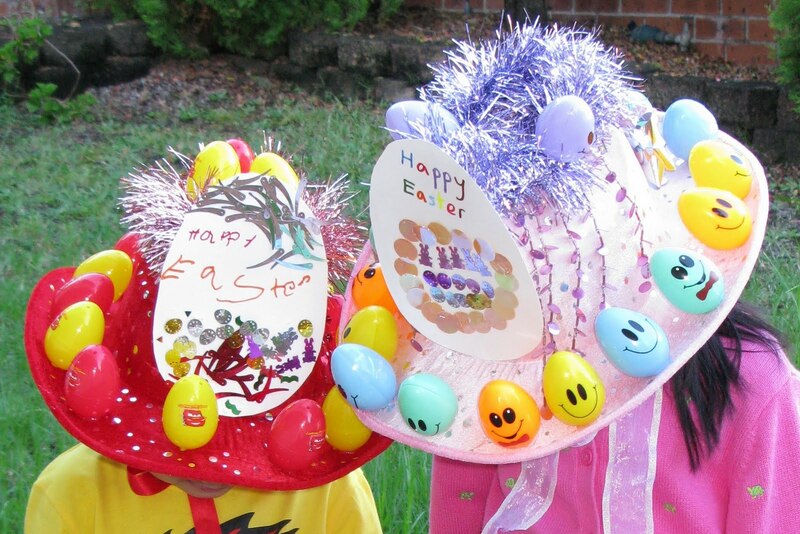 Thank God for a wonderful sunny day for Jeremy's first and Stephanie's last Easter Hat Parade! This meant that it was held outside on the astro turf, rather than cramming all of Infants and their parents and grandparents and friends inside the school hall (which was the plan because the weather forecast had predicted showers all week). Stephanie and Jeremy were very excited about decorating their hats last weekend (glue guns are great! ), and they both had a basket of gummy bunnies to share with their class friends after the parade. It was a fun way to end Term 1 of school! Just before the parade started, the doctor rang with the great news that Jeremy's immune system is "good for someone who is 6 months post transplant", although it is not back to normal yet. He can start having his childhood vaccinations, and the doctor will give us a timetable for these injections. He can stop taking Bactrim, so now he is down to one medication twice a day - his anti-viral tablets, which he will need to swallow for another 6 months or so. We will find out about his allergies soon.